We offer the latest technology, longest lasting energy efficient LED lighting. In short time, they pay for themselves. There is no need to change anything, except the bulb. We offer perfect-swap LED lighting for most applications that will save at least 50% energy use. Light Emitting Diode (LED) lamps are intended to replace screw-in incandescent, compact fluorescent and fluorescent light bulbs. They are made in standard light bulb shapes and are compatible with the voltage supplied to the sockets. LED lamps include circuitry to rectify the existing power source, which reduces the voltage to a level usable by the LED. Reducing the wattage in turn reduces the energy consumption, which of course, reduces your energy costs. Do you think that a bulb using less energy creates less light? This is not the case with LED. LED tubes are actually brighter in luminosity, which is why one LED tube replaces two fluorescent tubes in a T-Style fixture. The LED results are also a more pure, brighter and cleaner white light. 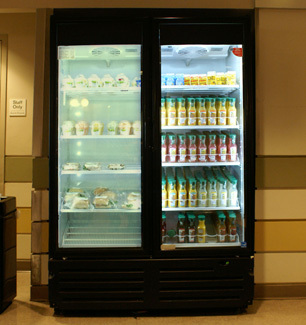 The lighting from LED bulbs better displays products inside vending machines, and best promotes area treatments. A vending machine with the old T-Style fluorescent tubes (left) and the new LED Tubes (right). Compared to fluorescent bulbs, LED light bulbs contain no mercury (unlike a Compact Fluorescent Lamp or CFL). LED bulbs turn on instantly, and the LED lifetime is unaffected by cycling on and off which makes the LED technology well-suited for machines and all other light fixtures where bulbs are often turned on and off. When you physically inspect a LED bulb, feel it's weight and inspect how its craftsmanship, you immediately know the product is built to last. LED light bulbs are also mechanically robust where other light bulbs are delicate, if not fragile in replacing. 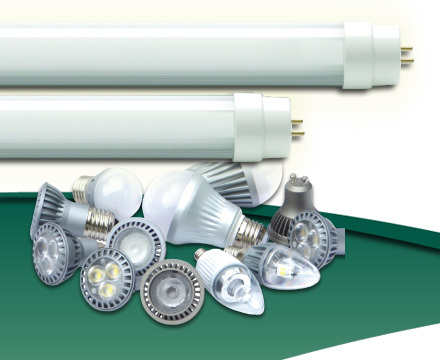 This picture illustrates some common examples of LED bulbs that fit into existing fixtures. White-light light emitting diode lamps have longer life expectancy and higher efficiency than most other lighting. This means you get the same amount of light for less electricity. LED sources are compact, and will easily swap without having to change anything but the bulb. If you would like to see how much money you could save annually by changing to LED bulbs, use our online calculator. By now you should be interested! Please select the Enroll - Energy Savings button to the right to contact your local Energy Savings Representative. Once you complete the brief online form, you will be contacted for a complementary energy survey. View and download PDF specification sheets on the most common LED lighting.